> Datto Inc. > As an MSP, What's Your In-House Backup, Disaster Recovery Solution? As an MSP, What's Your In-House Backup, Disaster Recovery Solution? 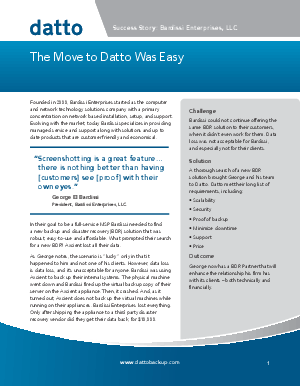 White Paper Published By: Datto Inc.
Bardissi relies on Datto for BDR. After experiencing their own data disaster with another BDR vendor, this MSP knew they needed a BDR that delivered business continuity—Datto. Datto delivers scalability, better security, proof of backup, award-winning support, and more. Datto wants you to succeed. As the only 100% channel-focused backup, disaster recovery (BDR) and intelligent business continuity (IBC) vendor, Datto is focused on the success of our Partners. Our Partners succeed by delivering award-winning solutions to their clients that are easy to sell, easy to manage, and will eliminate downtime in the event of a natural or technical disaster. How does Datto do it? Datto is the leading BDR and IBC vendor that delivers award-winning solutions that tackle the inevitable data challenges faced by today’s businesses. Most businesses will experience downtime, whether due to an aging server that crashes, a rogue employee, malware, or a natural disaster. The challenge to the business, and to their MSP, is how to most effectively and efficiently ensure their data is secure, backed up properly, and can be virtualized off-site – all while minimizing any downtime to the business.